it’s having the same effect on today’s markets. Don’t let the title mislead; This post is about economics, not politics. Trump’s QE is not like the Quantitative Easings of the past, but it’s having the same effect on today’s markets. Quantitative Easing came from former Federal Reserve Chairman Ben Bernanke, his last form of QE, dubbed QE3 directed the Federal Reserve to buy eighty-five billion dollars in bonds of mortgage-backed securities - every month. QE or Quantitative Easing created a new mindset for market traders and the financial media, one that gave them the impression that the 'Free Market' can be managed by government; ("it can't"). 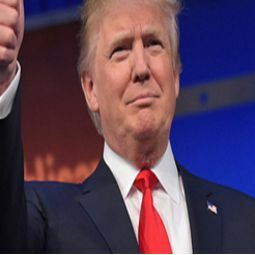 Trump’s QE is based on words and expectations, the words have come from Trump himself, and those who will be in his administration and the expectations are coming from market traders and financial media. For Trump’s part, he’s made promises to increase military spending, cut corporate & personal taxes, reduce regulations, expand oil exploration and pipelines, and renegotiate trade deals. These words have given market traders reasons to expect that the future will be filled with growth and inflation. As of Nov. 27th, 2016, the official U.S. Bureau of Labor & Statistics (BLS) inflation rate is 1.6%. 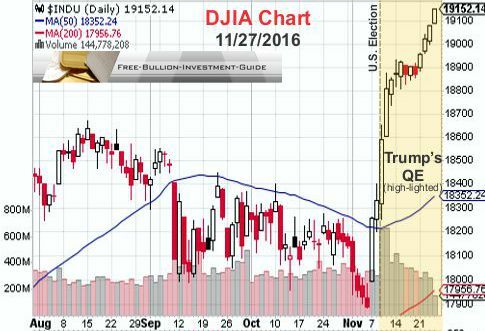 But, since the election, the reason for the bond sell off is due to the Market's "Expectation" of Higher Inflation. Bonds sell off in a higher inflationary environment because if the interest rate on a bond is lower than the rate of inflation, the bond is not worth holding. The result is; bonds lose value causing interest rates to rise. This also explains why gold and silver prices rose in April & May of 2016 during the Federal Reserve’s talk of Negative Interest Rates. These actions tell investors; "It’s better to hold something with no interest rate (gold) than an asset with a negative interest rate (bonds)." Also, Trump’s QE has given the market reason to expect higher growth in the future which has caused the markets to sell safer assets like bonds, gold, and silver for higher risk assets, namely stocks. Normally, Higher Inflation or just the Expectations of Higher Inflation should give gold and silver a boost. But, the precious metals are down due to everyone's expectation of the Federal Reserve to raise interest rates on December 14th. There are a lot of issue’s behind Trump’s QE, and they all have to do with the mind's of market traders. First off the bat, while I’ve been writing this blog post I’ve been listening to Main Stream Financial Radio, most it which I don’t agree with, but in consideration of the markets, I like to know what all sides think. In addition, mainstream financial news often mixes political leanings with financial facts, but I've listened to these stations enough to learn how to get the facts through the B.S. My point here is that from what I’ve heard about market traders in the news reports is that they see this latest market rise as the New Norm; my interpretation – its B.S. First, the chart below shows the Dow Jones Industrial Average (DJIA) rising in Trump’s QE market with trading volumes falling, and its indicator's (RSI & MACD) trading in overbought territory. The decrease in market volume can be partially explained in this tweet by Jesse Felder titled: ‘Stock buybacks fall to the lowest level in nearly 3 years’ – click here to see the tweet. I think a possible reason for the decrease in market volume is due to some professional market traders, those who make big trades with more frequency, decided to take an early end of the year vacation, after the election. Or perhaps the HFT computers have been switched off until better stock valuations materialize. Either way, I think it is possible that these professional traders have been replaced by new, euphoric retail investors who have flooded the markets selling all or part of their 401K’s and mutual funds in anticipation of better days ahead. The problem is many new investors are unaware of the negative issues that have been building up in the markets to this date; i.e. : near full employment, a Fed that is antsy to raise interest rates and a stock market that has gained value on credit, debt, and stock buybacks, not growth and earnings. Another factor that explains why this latest rise in the markets should not be considered the 'New Norm' can be seen in the Q-Ratio Chart below. 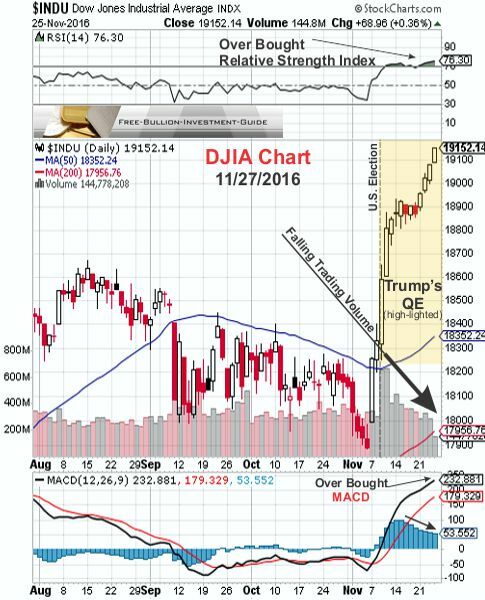 chart provided courtesy of advisor perspectives by Jill Mislinski. The first thing to recognize when you look at the chart above is that it was last calculated on November 1st, 2016, so the latest run up in stocks valuations, are not shown. “Ms. 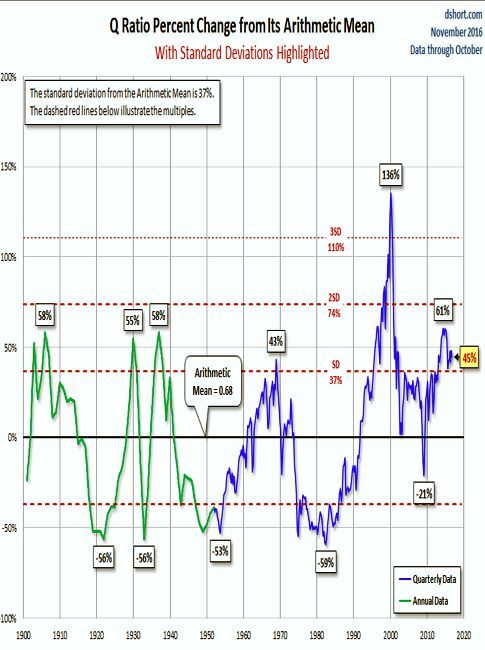 Mislinski's calculations show that the Q Ratio currently sits at 45 percent above the mean and is now in the vicinity of the range of the historical peaks, excluding the Tech bubble peak. Source: Variable Opposition - What is Tobin's Q Telling About Stock Market Valuations? In conclusion, whoever is investing in the current market should not base their trading on words and expectations, they should base them on actions. In addition, although Trump can fulfill some of his promises with the stroke of a pen, most of his promises can’t be fulfilled until Congress has their say; then it’s anyone’s guess to what will happen. Like last week, I've decided not to post any charts this week for Gold, Silver and the U.S. Dollar because they are continually breaking key support and resistance levels. The dust apparently has not settled yet in any of these markets, and although some technical lines are showing up on the charts, the way prices are moving these lines could be broken in an instant.